BetButler are in trouble. One way or another they're in trouble, it might not be that they are about to go under, but the quality of the customer service and the bad press they've been receiving means as a company they're struggling and will continue to do so without radical changes. I've made a few blog posts on the subject, a lot collating information from other places on the net, and with every step forward there seems to be two back. If you have been unable to get your money out of BetButler, please sign up to The Gambling Times forum and register your details so they can keep track of how many withdrawals are outstanding. Starting with the basics, BetButler is a bookmaker brokerage. They allow you to place bets across multiple other providers to, in theory, ensure you receive the best odds and aren't tied to one provider. In practice (as shown by the upholding of a complaint about their best odds guarantee) this isn't always the case, and regardless they will be charging you a commission on winning bets to cover the price of their service. So what's the problem with BetButler at the moment? The communication has been poor, but it appears to hang on account and customer verification. Why this process should be any different to that undertaken by a different bookmaker is unknown, but it seems that the standard process of verifying address and age through payment details is not suitable for their service. This may be because of the brokerage process, as some customers could place a bet via BetButler that is actually placed with Ladbrokes, even though that customer is barred from betting there. To our eyes that just shouldn't make a difference, and even if it does, that should be discovered at the point of verifying the identity of the customer at the begining of the process, not by causing delays of over a month on withdrawals for customers. That's the main thrust of this problem, and why customers are complaining on a daily basis, the time it takes to withdraw funds. There are no issues with deposits, you could set up an account right now and deposit and bet without issue and, more worryingly, without any mention of potential delays in making a withdrawal. All the BetButler site says is that withdrawals will take five days (long, but not too long for the betting industry and that length to allow the broker to receive the funds and then pass them on, not unreasonable). 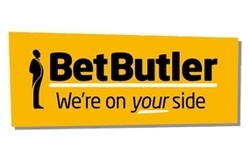 Other issues that have been noted are that the parent company, BetClearer, has a winding up petition against it, and both they and BetButler are behind on their accounts. In addition, back in February BetButler changed their terms and conditions to remove the piece about separating client and business funds in the event of liquidation. Whilst that didn't provide a massive amount of protection anyway (you can't get money from someone that doesn't have any!) it was another sign that cashflow wasn't quite right. Add in some additional extra value bonus offers for new and existing customers and it has the hallmarks of a company in trouble. As is the norm (see the rise and fall of canbet) the Gambling Commission haven't done anything to reassure customers. Even when presented with unanswered complaints to BetButler (something the Commission say they will look in to) they have done little. If you're looking in that direction then you're barking up the wrong tree. If you have money you can't get at in BetButler then joining a forum which deals with Bookmaker Complaints and sharing your story is a great first step. Through a forum you'll find out more information,and if there is further action required, you can be part of it rather than bringing your own potentially expensive case. It's also interesting to read some of the stories and processes people go through to get their money back, including company house searches, visits to office and legal proceedings. At this stage there's nothing else we can do. We know that on April 22 the BetButler site went down for maintenance and was a long time coming back. When it was closed we thought it was game over, but they're back and that's positive so let's keep the faith for now. 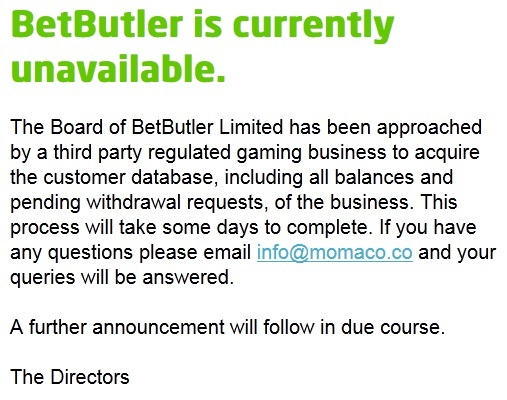 As of 29 August 2014 BetButler closed. The website is showing the statement to the left, and they claim to be in discussions with other companies. Whether that is true or not remains to be seen. To read up on everything I've written about BetButler click here.